Located off SR 47 between Crawfordsville and I-65. On forested property along Sugar Creek. 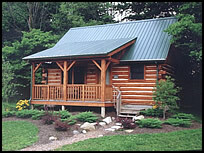 Traditional Cabin - Luxurious log cabins for couples include a stone fireplace with gas-burning logs, oversized whirlpool bathtub, entertainment center, queen-size bed, oversized shower, double-bowl bathroom vanity, complete kitchen, covered porch and screened deck, gas grill, high-pitched cathedral ceilings, ceramic and plush carpet floor coverings, and of course, central heat and air conditioning.